San Jose, CA Free Hot Water, a leading commercial solar hot water manufacturing and distribution company, has received two new Solar Rating and Certification Corporation OG-100 Certifications for its 4000 series and 5000 series solar thermal collectors. Equipment must be certified for performance by the Solar Rating Certification Corporation (SRCC) to qualify for most state and federal rebates and incentives. 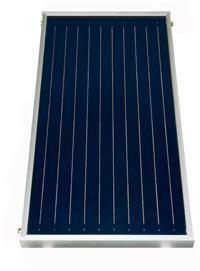 Developed for performance and longevity, the new FHW 4000 series flat plate solar collector is a 21.86 sq. ft. (20.3 sq ft aperature area) collector designed for either open or closed loop systems. Dimensions: 76.5” x 41”. SRCC clear day output: 21,500 BTU’s. Installers can connect up to six FHW 4000 collectors with a very low pressure drop. The 4000’s construction features durable all-copper and aluminum, automated laser welding technology, and tempered solar safety glass, and a PVD selective coating. The slightly larger 5000 series is a high performance solar thermal collector that measures 22.28 sq ft with a net aperature area of 19.91sq ft. 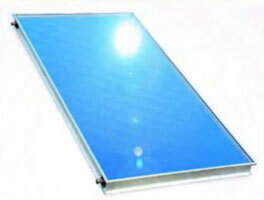 It features a deep drawn aluminum tray and high transparency, and low-iron tempered glass for maximum absorption. Dimensions: 79.5” x 40”. SRCC clear day output: 23,100 BTU’s. Free Hot Water’s flow design allows installers to connect up to eight 5000 series collectors with a very low pressure drop. Both the 4000 and 5000 series can be installed on pitched roofs or flat roofs and purchased with an installation friendly mounting system for tile or composition roofs. As with all of Free Hot Water’s products, the company offers a 10-year limited warranty. Free Hot Water products are used by distributors, independent dealers, retail outlets, installers and contractors. Free Hot Water works with a worldwide network of distributors, independent dealers and installers to support Commercial, Residential and Municipal customers with purchasing decisions and installations. We are always looking for dealers and experienced professionals to work with us. The Solar Rating and Certification Corporation currently administers a certification, rating, and labeling program for solar collectors and a similar program for complete solar water heating systems. Collector testing apparatus SRCC’s certification program operating guidelines, test methods and minimum standards, and rating methodologies require the performance of nationally accepted equipment tests on solar equipment by independent laboratories which are accredited by SRCC. The test results and product data are evaluated by SRCC to determine the product’s compliance with the minimum standards for certification and to calculate the performance ratings. Equipment which has been certified and rated by SRCC is required to bear the SRCC certification label which shows the performance rating for that product.